I’ve always found it a bit unfortunate that my best productivity results were always linked to being seated at my office desk. And for good reasons: using a pair of large, high definition monitors affords me a great view of different documents, media, and diagrams without having to toggle between items. The experience blows away the smaller and more portable format of a laptop, especially when creating content for client deliverables, Pluralsight courses, or images for this blog. I’ve experimented with a raised desk, but found standing all day fatiguing and uncomfortable. 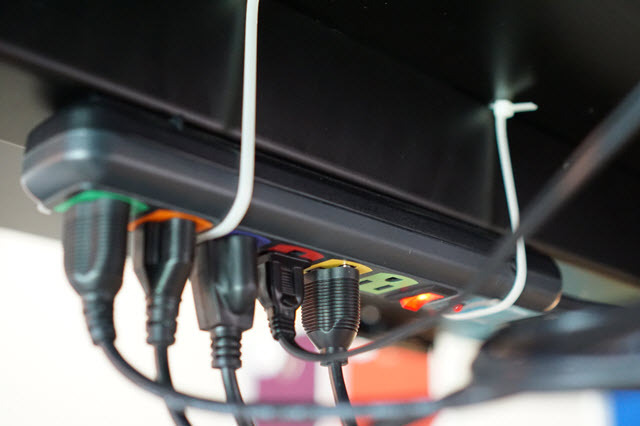 Setting up dual workstations, or moving around a laptop, requires spending more time setting things up and synchronizing content between terminals than actually working on content. I did some more research and saw that StandDesk was a funded Kickstarter project owned by Steven Yu, who was pretty frustrated with the high cost of motorized standing desks or “sit-to-stand” desks. 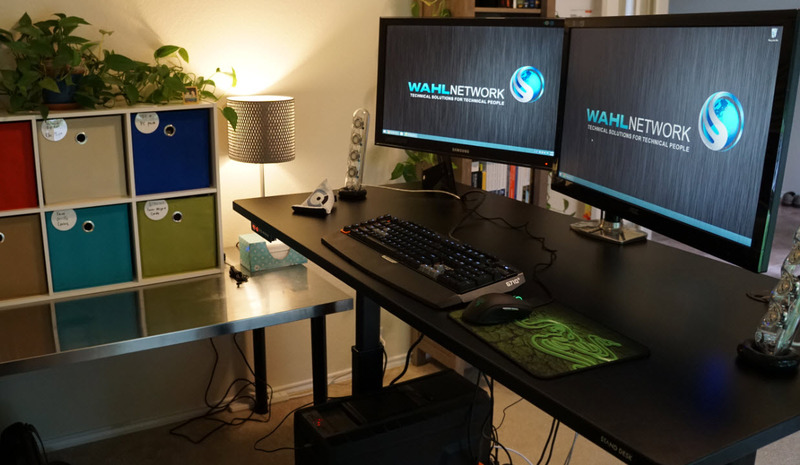 His model costs only $399 US plus options to purchase or provide your own table top, power strip, mat, crossbar, cable management tray, and more. It’s a lot like ordering a Tesla vehicle; you get to pick all of the options. Derek had some nice comments about the desk after it arrived. Convinced, I decided to snag one with a black frame with black laminate top and splurged for the deluxe memory controller, which allows four height presets. After a week, the desk arrived! Building the desk is pretty straight forward if you follow the detailed instructions. All of the screws, bolts, washers, and spring washers come in separate bags that are marked with their destination: tabletop, frame, and spares. There’s an included hex tool for fastening all of the bolts into the frame, or, pop in a hex bit into your power tool – just be careful not to over-tighten. All of the parts have a high quality finish to them with rounded corners to avoid cut hands. Below is a shot of all the bolts that are fastened to the leg assembly – it’s not going anywhere! 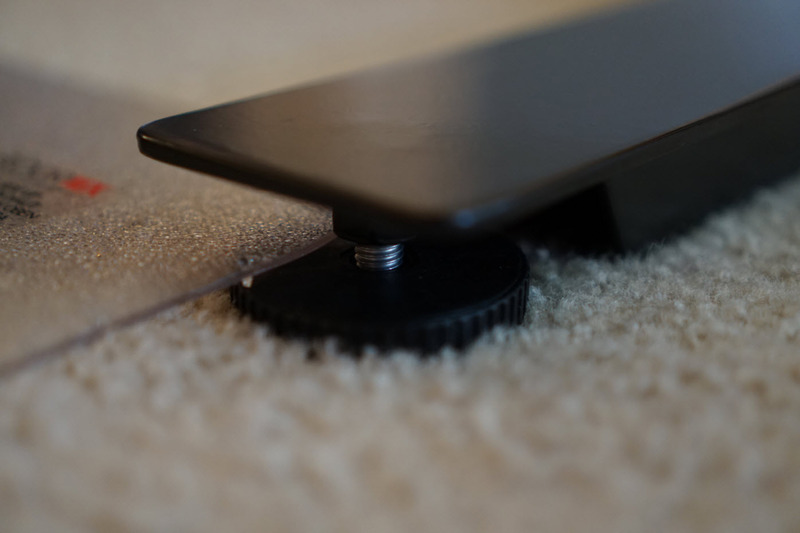 The foot assembly also includes height-adjustable rotation gears to stabilize the front-to-back motion of the desk, which was very helpful for the carpeted home office floor. I’m also using a floor mat to protect the carpet from chair wheel damage at sitting height, and push the chair back when I’m transitioning to standing height. The deluxe controller was worth the investment. The buttons are all variable pressure programmed, meaning the up and down arrows will adjust the height by 1/10th of an inch with a single press, or continuously adjust the height by about 0.7 inches per second if you hold the button for two seconds. 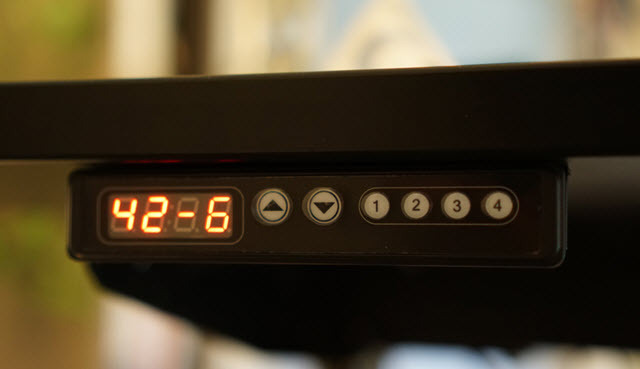 The memory buttons are similar in design: push to recall the height setting, or hold the button down for five seconds to store a new height value. I’m using button 1 for my sitting position and button 4 for my standing position, which gives me 2 and 3 for anything I might need in the future. The motors are quiet but can be heard in the next room over. It takes perhaps 25 seconds for the desk to fully transition from sitting to standing based on my presets. I use an Ergotron side-by-side monitor arm (specifically this LX model), causing the desk to get a little rocky when I shift my weight against the keyboard. In hindsight, I should have purchased the crossbar upgrade for my desk after determining the weight of my monitors. If you plan to do a dual monitor setup, get the crossbar. Because gravity compresses the discs in a human spine, I need to raise the desk higher in the morning and lower it in the evening. An anti-fatigue mat is absolutely essential for long duration standing. 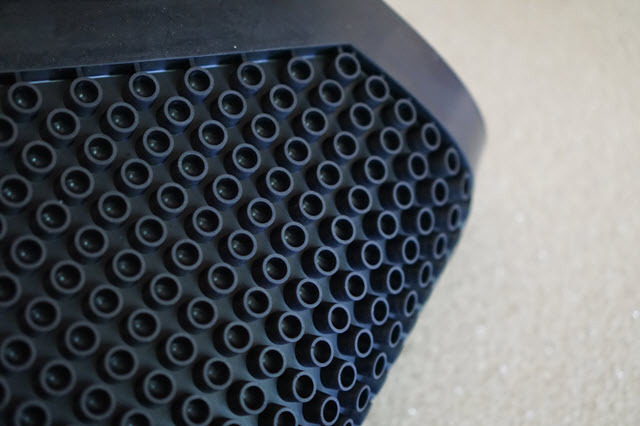 I purchased an Octagonal mat from SmartCells, using rubber “cells” that are pictured below. Cable management is challenging. As you can see in the photo below, it’s important to measure the lengths of mouse, keyboard, monitor, speaker, and power cables to ensure they reach when the desk moves. The picture below was taken prior to using any cable management. It caused my eye to twitch. Monitors: Samsung on the left, AOC on the right. My first mission is to set the desk to the maximum height and cable up the electronics knowing the furthest distance they need to reach. The rest I have bundled up under the desk using cable management items (see the end of this post for part details). 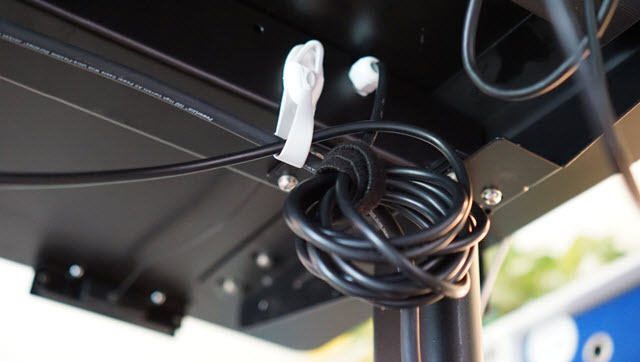 Below is the StandDesk power cable with a Velcro wrap and Command Cord Bundler. The existing power strip is strapped to the StandDesk frame with zip ties. Cheap, hidden, and simple. 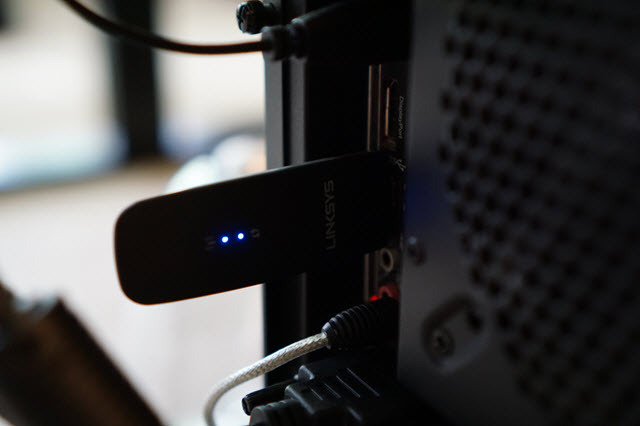 My desktop’s network cable is replaced with a Linksys Dual-Band AC1200 Wireless USB 3.0 Adapter (WUSB6300). It connects to my Linksys AC3200 Tri-Band Smart Wi-Fi Router at 867 Mbps; just shy of a gigabit. I can now raise the desk to a height of about 45″ without any cable snags. Ever since Matthew Brender, co-host of the must-listen Geek Whisperers podcast, told me about the Pomodoro Technique for time management, I’ve been a fan. I use a web-based timer called Tomato Timer. The idea is to break up your day into smaller, 25 minute chunks of focused time. During these small “sprints” of activity, I disable distractions (phone, email, social media, etc.) and usually listen to music while working on a task. Tasks are simple – such as “write content for this blog post” (which I’m doing right now) or “submit my expenses for work.” When the timer hits 25 minutes, I disengage from the task and take a 5 minute break. In the past, this meant getting up and walking around for a bit, or if I was feeling particularly energetic, dragging out the laptop to go work in another room of the house for a period of time. 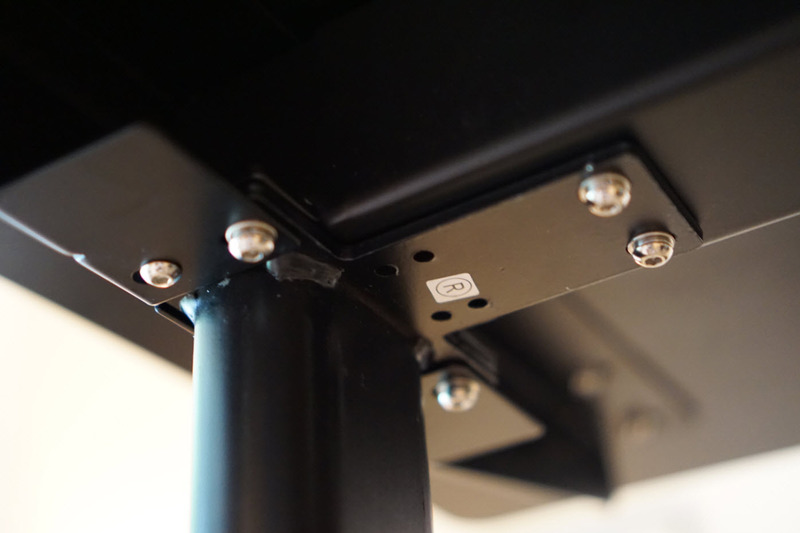 With the StandDesk, I now use it as a time to toggle the desk from sit-to-stand or back again. During the height adjustment period, I’ll often refill my water glass or just stretch a bit. I find that this extra bit of physical activity is highly beneficial for mental health: I don’t feel like I’m stuck in my office all day in one single position. And of course for physical health, since I’m constantly moving, adjusting, stretching, and not just plopped in a chair. Thanks for the write up! We just renovated the basement in our house and I have a small home office setup there. Been looking at options for standing desks and this looks like a strong canidate. In regard to an online timer, check out https://www.toggl.com/, it has the simplicity of a start/stop timer, but also has powerful reporting. For single users most options are free. Most of the subscription features revolve around teams. Note: I am not affilliated with toggl, I just think it is a cool tool to keep track of what you do on any given day. Awesome post Chris! SO well written, as usual ! I too just started using a standing desk with dual monitors (and even, periodically, the tomato timer). I’m already loving the whole setup as well. Apparently there is a hormone clock in our bodies which, after 2 hours of sitting or of inactivity, sends a signal to deposit fats in our bellies and in other undesirable places. Simply standing up RESETS that clock thereby preventing those deposits. Thanks for all the research and the tips not only on the StandDesk, but also on the Pomodoro method.